47th Street/Diamond Jewelry way a great place to shop, work or do business. Call or e-mail for information on opening a business in our community. Seven days a week there are businesses open and you will always find good value. The grade system to denote how well pearls in a piece of jewelry match, listed as excellent, good, or fair. A classification scale, ranging from light to dark, and which indicates the color inensity of fancy colored pearls. Grown mostly in French Polynesia, they are well-known for their beautiful colors ranging from silver-grey to purple-black. A pearl with balance and form with equal or corresponding characteristics on opposite sides. Imperfections on a pearl’s surface, often called spots, blisters, or indentations. Large pearls created by tropical oysters in Australia, Myanmar, Indonesia, and the Phillipines. The diameter of a pearl, measured in millimeters, and the most important element in determining price. The characteristic used in determining the value of a pearl. A pearl necklace measuring 40+ inches in length. A pearl necklace measuring 18 inches in length. A pearl rounded on one side, tapered on the other. A pearl necklace measuring 32 inches in length. The substance secreted by an oyster to form a pearl. The iridescent lining of an oyster’s shell, iti si often used as a center for a man-made pearl. A unit of measure used to determine a pearl’s diameter, equal to approximately 1/25th of an inch. A pearl necklace measuring 24 inches long. Soft tissue located inside an oyster. A small parasite or bead which causes the pearl growing process. This can be naturally or artificially inserted. A pearl necklace measuring 16 inches in length. The main mineral component of a pearl’s outer layer. Patented by K. Mikimoto in 1916, pearls cultivated by an artificial insertion of a small bead, often made of mother-of-pearl and mantle tissue, into the oyster. The basic color of a pearl. Pearls can be white, cream colored, yellow, pink, silver, or, black. A pearl with balance of form with equal or corresponding characteristics on opposite sides. Cultured pearls grown in Japan and China. The measurements, in millimeters, that indicates the width of the ring band or shank. The width of the table divided by the total diameter of the diamond. Located at the top of a diamond facing out from the setting, it is the largest facet on a diamond. A grade given to the overall uniformity of a stone’s cut with a scale ranging from poor to excellent. Poor symmetry will hurt the sparkle of a diamond. The amount of light that reflects out of a diamond that creates the fire and brilliance. A stone set alongside or encircling a center stone. The part of the ring that encircles the finger. A grade given to the external finish of a stone. The bottom portion of the diamond form just below the girdle. A hint of another color, which can be bluish, pinkish, or silverish. A scale to determine the relative hardness of minerals with 1 being the softest and 10 being the hardest. The exact geometric proportions to which a diamond is cut. A good make will maximize the brilliance and fire of a diamond. Trace minerals, fractures and other imperfections in the stone, which are created during the diamond’s formation underground. The shape of the gemstone. For example, the head that holds an ideal-cut is round. Attached to the ring shank, the head of the ring holds the center stone in place. The narrow band around the width of a diamond. Colored light reflected from within a diamond. The flat polished surfaces of a diamond. Diamonds cut to maximize the weight of the stone, generally at the expense of the fire and brilliance. In other words, they have less sparkle. A diamond that has no inclusions visible to the unaided eye. The height of a diamond divided by the width of the diamond. It is critical to creating brilliance and fire in a diamond. The eight of a diamond (measured from the culet to table). Diamonds cut with acceptable, but not perfect, cut proportions. Known to have very good brilliance, they make excellent jewelry. Diamonds cut to fit very strict requirements for depth and table percentages and also to maximize the fire and brilliance of the diamond. Round diamonds that are perfectly proportioned and have high grades on polish and symmetry. Any cut that utilizes 58 facets. It can be round, oval, radiant, pear, or heart-shaped. Commonly used to refer to both the shape of a stone (round, pear, oval, heart, etc.) and the make (the exact geometric proportions to which a diamond is cut). The make of the stone is the most important factor in determining how much sparkle a diamond produces. The foundation facet of a diamond. The preferred culet is visible only as a tiny focal point where the facets of the bottom portion of the diamond converge. The rounded finish on a ring’s interior, designed to provide additional comfort for long wear. A grade given to a diamond to describe the color tones of the stone. The color scale ranges from D, meaning completely colorless, to z, which has a distinct yellow hue. As the scale moves from D to Z, it indicates increasing levels of yellow and brown tones. A cluster of small inclusions inside a diamond. A grade given to a diamond to describe how many inclusions the diamond has. The clarity scale ranges from FL (flawless), meaning no internal or external flaws, to severely included (13), meaning a diamond with many visible flaws. The central, most dominant stone in a piece of jewelry set with multiple stones. It is also known as the solitaire. A unit of weight for a diamond — the equivalent of 200 milligrams or one-fifth of a gram. White light reflected up through the surface of a diamond. The importance of keeping your receipt cannot be emphasized enough. With it, you have proof. 1. Return to the store with your receipt and explain your problem to the salesperson who served you. If the salesperson can’t, or won’t help, ask to speak to the owner. 2. If the owner refuses to resolve the dispute, put the details of your complaint in writing and send it to the owner by certified mail, return receipt requested. 3. If the owner doesn’t respond within two weeks, contact the New York City Department of Consumer Affairs hotline at (212) 487-4444. You may also write to the Department at 42 Broadway, New York, NY 10004. In some shops and exchanges on 47th Street, you’ll see signs that say “20%Off,” “50%Off,” “80%Off,” “Wholesale to the Public,” “Discounted Prices,” etc. You will also see these signs at department stores, mall jewelers, and independent neighborhood jewelers, as well as on 47th Street. You have good reason to believe that jewelry on 47th Street is offered at a good price because of our proximity to jewelry manufacturers and diamond dealers, and because of the intense competition. But that doesn’t mean that everything you see is a bargain. The only way you can determine if the item is a good buy at the stated price is to comparison shop. Look for a comparable item in several different places. When you see price differences, by all means ask the jeweler to account for them. A good salesperson should be able to explain why their merchandise has a higher price tag. If you’re not satisfied with their answer, go elsewhere. You may also want to ignore the discount signs. Shop around and ask questions. Many 47th Street jewelers will offer to buy gold or diamond jewelry. You need to be just as diligent in shopping around for a buyer as you would when making a purchase. This is a lot easier in the Diamond District because there are so many merchants offering to buy precious jewelry. In selling your jewelry, make sure the dealer has a properly displayed second hand dealers license from the New York City Department of Consumer Affairs. While you may only care about the most cash you can get for your gems, the licensing law protects other consumers by preventing the resale of stolen merchandise. On all jewelry purchases, consumers must be given a written sales slip showing the total amount of the purchase, including a separate statement of sales tax, the date, and the business name and address of the merchant. The sales slip should also include all representations made in the sale of the item, including its type, kind, name, grade, quality, quantity, size, weight, color, character or substance. In most cases, the sales slip will be your only proof of the claims the merchant has made to you. Don’t lose it. If you later find that any misrepresentation occurred (e.g. as a result of bringing the jewelry to a gem lab or appraiser), then the sales slip gives you legal recourse. Without a written record of the merchant’s assurances, any later dispute will become your word against the merchant’s. Platinum is stronger than gold, harder, heavier, and more scratch-resistant. Platinum is more expensive than gold, and it is generally manufactured in a much purer form of the metal than is the case with gold. If a piece of jewelry is at least 95% pure platinum, then it can be marked “platinum”, or one of the usual abbreviations – PT, pt, PLAT, etc. If the jewelry is at least 75% pure platinum, and most of the rest of the alloy consists of “platinum group metals”, (i.e. iridium, palladium, ruthenium, or osmium), then the piece can be stamped platinum, but an abbreviation of the other predominant metal must be stamped before the word platinum. For example, 10% iridium jewelry would have to be marked “Irid.Platinum” or IRID PLAT. As with gold, if there is a quality stamp on platinum jewelry, there has to be a trademark right next to it. Look for the quality stamp and the manufacturer’s trademark. Jewelry is seldom made from only pure gold, because pure gold is soft and bends too easily to maintain its shape. To avoid this problem, manufacturers mix gold with other metals. The resulting alloys are stronger and more wear-resistant than pure gold and can also be used to give the metal other colors, including pink, red, green and white. In its natural state, gold is bight yellow. But jewelers also manufacture white gold, an alloy that mixes pure gold with copper, nickel and zinc. White gold is somewhat harder than yellow gold, and some people prefer it because it compliments the look of their diamond. The amount of gold content in a piece of gold jewelry is its karatage. Pure gold is called 24 Karat gold, of 24K. The gold content of less-than-pure gold is labeled in fractions of 24. For example, 14 Karat gold, or 14K, is 14/24 pure, meaning that 58.5% of the metal is gold. The rest is usually copper and silver. In the United States, the lowest karat gold that can be marketed as gold is 10K. The most popular variety is 14 Karat. Jewelry does not have to be marked with its karatage, but most of it is. If there is a Karat quality stamped on the jewelry, a manufacturer’s registered trademark must be stamped right next to it. This means that the manufacturer is standing behind the claim as to the piece’s gold content. Always look for a karat mark and a trademark on gold jewelry. Make sure these marks are stamped on the body of the piece, not just on a clasp or hinge. A pearl is also a gem, but normally it’s considered in a category all by itself. Natural pearls are rare and very expensive and are grown naturally. Most pearls sold today are cultured pearls, meaning that the pearls were cultivated by artificial insertion of a small bead into the oyster by the manufacturer. The highest quality sapphires are graded by their blue or violet-blue hue. Though sapphires are most frequently found in blue, they also come in every color but red. Red sapphires are actually rubies. The deep blue color comes from trace minerals, iron and titanium. Like all color gemstones, sapphires often contain fractures called inclusions. Flawless sapphires are rare and high valued by collectors, and even other expensive sapphires include some fractures. The darker the sapphire’s color, the less obvious are the inclusions.When shopping for sapphires, look for sapphires that are lightly- to moderately-included and have a medium to medium-dark color. The most valuable sapphires have a pure color or only “slight” variations of other colors. Like emeralds and rubies, sapphires are described as “light,” “medium-light,” “medium,” “medium-dark,” and “dark.” Though higher clarity levels are more common with sapphires than with rubies and emeralds, internally flawless sapphires are very rare and command extravagant prices. Since sapphires generally include some fractures, look for a sapphire with a darker color, as the inclusions will be effectively hidden in these darker gems. The most valuable rubies have an orangish, pinkish, or purplish red hue, a medium-light to medium-dark tone, and saturated color. The most valuable rubies are those that have a pure color or only “slight” hues of other colors. Tone refers to the depth of color, ranging from colorless to black. Like emeralds, rubies are described as “light,” “medium-light,” “medium,” “medium-dark,” and “dark.” The most sought-after rubies have are in the medium-light to medium-dark ranges. Saturation, or color purity, refers to the degree to which the ruby is free from brown or gray hues. The most desirable gemstones, which show little gray or brown, are often described as having “vivid” or “strong” color saturation. Unlike diamonds, rubies have no geometrically configured cut for maximum brilliance. Inclusions are generally more apparent in light- to medium-color rubies, than the darker varieties. Since rubies generally have some inclusions, look for a ruby with a darker shade, as the inclusions will be effectively hidden in these darker gems. As with emeralds, the carat weight of a ruby is not necessarily an accurate gauge of the gemstone©ˆs size. There are several key characteristics that define a high-quality emerald. Most important are color and clarity. The best emeralds are pure and a very bright green with no more than a slight hue of yellow or blue. Tone is judged by the depth of the color, ranging from colorless to black. Emerald tones are described as “light,” “medium light,” “medium,” “medium dark” and “dark.” An emerald’s clarity refers to the absence of inclusions. The rarest emeralds have no inclusions, although inclusions are acceptable and even expected by knowledgeable emerald buyers. When buying an emerald, be sure to ask about the cut of the emerald and its size. Cut refers to the proportions that are used to produce brilliance in emeralds. The carat weight of emeralds, unlike diamonds, does not necessarily provide an accurate measure of the gemstones©ˆ size. Different gemstones have different densities (mass per unit volume), so two gems that appear to be the same size may actually have very different weights. For example, a ruby is denser than an emerald, so a 1-carat ruby will look smaller than a 1-carat emerald of the same shape. Different colored gemstones have a long history as symbols of power and status, as indications of personality traits, as charms to ward off evil, and as preservers of good health. According to one legend, a blue sapphire worn by a man indicated wisdom; on a woman, it meant jealousy. Today, some of the myth quality survives through the association of specific colored stones with particular zodiac signs, months of birth, and anniversaries. Now there are so many alternatives to the big three that have value in the marketplace, show comparable beauty, and have the same rich colors, that the distinction is hardly used anymore. In colored gemstones, color is the most important determinant. In general, the closer the stone is to a pure spectral color, the more valuable it is. As with diamonds, carat weight is an essential part of a gemstone’s value. Clarity is not as much of an issue for gemstones as it is for diamonds. Flawless colored stones are even more rare than flawless diamonds. How do you know the price being offered to you is fair and reasonable? The answer is “shop around.” You have to look at many different diamonds offered by many different jewelers. Happily, 47th Street is a great place to comparison shop because there are so many independent, competing jewelers, all on the same block. Ask to look at their loose stones and ask the jeweler about color, cut and clarity (whether there is a grading report or not). Don’t be afraid to ask jewelers to explain why one stone has a higher price than another. Diamonds with imperfections, e.g. cracks or black pinpoints, are less valuable than those without. Some manufacturers have worked to give nature a helping hand by using new techniques to improve the appearance of natural (but imperfect) diamonds. These techniques include fracture filling, irradiation, and external coatings. All of these treatments are completely legal, as long as they are disclosed to the buyer and are not meant to misrepresent the product. Any such misrepresentation is illegal. Fracture filling is a semi-permanent process in which a foreign substance is infused into cracks in the stone to improve its naked-eye visual clarity. Because the filling is not permanent, GIA GTL and most other gem labs will not grade fracture-filled stones. A grading report is a documentation of a careful examination of the stone by qualified professionals. Regardless of which lab it comes from, the report will note the stone’s shape, overall measurements, and carat weight. It will also note any inclusions and will assign a clarity grade and a color grade. Not all diamonds come with grading reports, and you should not conclude that the absence of a report means that there’s anything wrong with the stone. Many beautiful stones are sold without reports. With or without a report, ask your jeweler to explain how cut, clarity and color contribute to a stone’s value. The clarity grade of a diamond is determined by the number, size, and location of imperfections, or inclusions, within the stone. As with color, the GIA has set grade for clarity, which are widely used, in grading reports and by appraisers and diamond sellers. F1 Flawless ¼ no blemishes. IF Internally Flawless ¼ no inclusions and only insignificant blemishes. V VS1 & V VS2 ¼ Very, very slight inclusions. VS1 & VS2 ¼ Very slight inclusions. SI1 & SI2 ¼ Slight inclusions. I1, I2 & I3 ¼ Imperfect with obvious inclusions that are usually eye-visible. Color is also a major determinant of value. There are naturally occurring colored diamonds – green, blue, red, and many pastels – but these are rare and very expensive. Normally when we talk about the color of a diamond, we’re referring to “white” diamonds that are supposed to be colorless. The finest and rarest of these stones are indeed completely colorless. The industry grades the color of diamonds using a variety of different scales. The most common is the Gemological Institute of America (GIA) system. The highest GIA color grade is D. Stones graded as D, E, or F are considered to appear colorless. The G through J grades, called “near colorless” may look colorless to the untrained eye if they are well cut and set in jewelry. K, L or M diamonds have a faint yellowish tint. In looking at diamonds, shape refers to the overall design of the stone. The most popular shape is the familiar round diamond, but you’ll also see beautiful stones cut in pear, heart, oval, marquise, emerald cut, princess cut, radiant cut and other shapes. The proportion of a diamond compares its height with its width. Cut means how well the design of the diamond, its shape and proportion, has been crafted by the diamond cutter. Cut is a major determinant of a stone’s value. The purpose of a good cut is to give diamonds maximum brilliance. Brilliance means the amount of sparkle or light that’s returned to your eye from the diamond. 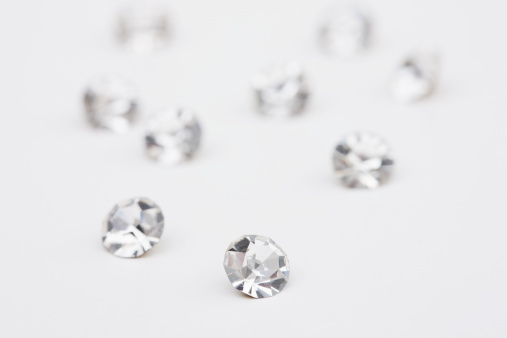 Diamonds that maximize this quality are often said to be the most valuable. The weight of diamonds is measured in carats. A carat is one fifth of a gram. Since larger stones are harder to find than smaller stones, the bigger diamonds sell for more money per carat. One carat diamonds will sell for more on a per carat basis than one-half carat stones, with all other elements being equal. According to Federal Trade Commission rules, it’s an unfair trade practice to misrepresent the weight of a diamond, and any weight quoted to you has to be correct within .005 carats. Diamonds are the hardest natural substance known to man. The first and most important consideration when buying a diamond is to choose a stone that you like. You want to buy a diamond that you expect will look good on you. Nothing you hear about value of a particular stone should influence you to buy it if you don’t like it. The market assigns a value to a diamond on the basis of its carat weight, its shape, its cut, its color and its clarity.